Paradise Peak, St Martin's highest point, rises from the centre of the island to a height of 1,390 feet (424m), and is crowned with a communications tower. 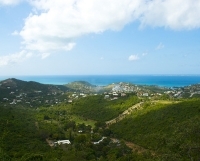 Visitors can climb through thick woods twisted with vines and full of colourful birds to reach the summit, where there are two observation decks providing spectacular views of the island and surrounding region (on a clear day you can see all the way to Anguilla). Paradise Peak is a great place to stop for a photo opportunity in St Martin, even if just for a few minutes. The Loterie Farm Nature Reserve is nestled on the slope of Paradise Peak, and is set on the site of a 135-acre former sugar plantation, established in 1721. The reserve has many miles of groomed hiking trails through the beautiful forest, where visitors can spot local flora and fauna. 90-minute guided tours are offered, and are worth it for the fascinating historical, cultural and scientific facts given about the area. The most popular attraction at Loterie Farm is the zipline, which is divided into three zones for children, adults, and thrill-seekers. Visitors glide along the canopy between centuries-old mango and mahogany trees, via a series of cables, ropes and suspended bridges.